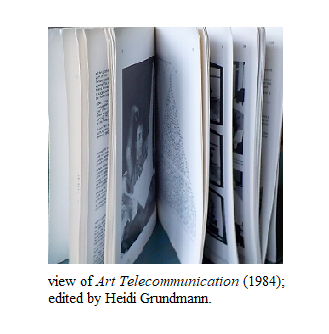 Review of Heidi Grundmann, Art Telecommunication. Vancouver: Western Front; Vienna: BLIX, 1984. P ublished in 1984, long before the social-media infused infosphere became a part of everyday life, Art Telecommunication, with its multi-lingual text, conceptual black and white and shades of gray images, and its combination of artist's statements, original documentation, and the words of critics, is an iconic work that --- with seminal theory, futurist prediction, and the lineage of networked art practice -- supplements contemporary immersive social media. Edited by cultural critic Heidi Grundmann, producer of KUNSTRADIO-RADIOKUNST, and published by Western Front in Vancouver, B.C. and BLIX in Vienna, Art Telecommunication (also known as Art + Telecommunication) epitomizes the aesthetic of late 1970's and early 1980s networked projects. Primary essays in this book are by Eric Gidney, Roy Ascott, Tom Sherman, and Robert Adrian X. In addition to their own work, their statements describe works by other artists, including the SEND/RECEIVE Project, Tom Klinkowstein's Levittown, and Kit Galloway and Sherrie Rabinowitz' Hole in Space. "We have difficulty imagining the world before the Internet. It takes a material object, like this book, to remind us that there once was a time when unmediated physical contact between humans was the norm, when long distance travel was expensive, and when a conversation in text and image over distance felt like science fiction. Art + Telecommunication is such an object. Since its publication, this book has functioned as a benchmark against which to measure, not only the rapid evolution of media, but also the critical understanding of its impacts and implications for artists and for the world. The idealistic notions expressed here, of 'dispersed authorship,' the 'noosphere,' and 'Indra�s Net' were tempered by the suspicion that contained within the technological acceleration of globalization lay the threats of surveillance, cultural homogenization, exclusion and social control. The authors were acutely aware that their book was being published in 1984. These texts are not only a fixed document of their time, like a fossil, but continue to resonate now, as alive (or not) as the network itself. "LexsSor System überträgt Bücher von Künstlern, Seite nach Seite und in Farbe. Genau wie beim Telefonieren konnten die LexsSor Teilnehmer irgendeines von 9.500 Künstlerbüchern in dem Archiv einfach anwahlen. " "The LexsSor system transmits artists' books, page by page in colour. As easily as telephoning, LexsSor owners could dial any of the 9500 artists' books in the archive." 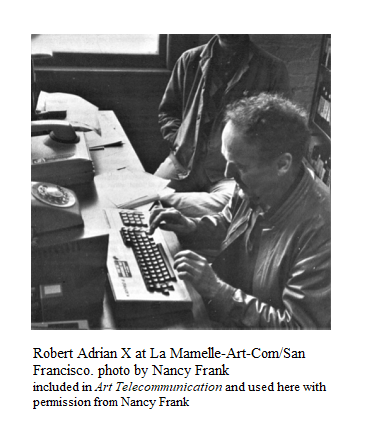 Setting the stage for a diverse networked culture of the future, 30 years ago, Art Telecommunication used an innovative approach to publishing in multiple languages. Today, the increasing number of languages represented on the Internet could auger a widening of filter bubbles to include International content -- I now have French, German, Spanish and Catalan in my Twitter stream -- and subsequently a greater need for the study of languages. For such works, even if we begin to think in terms of X-reality as increasingly blurring the distinction between virtual and physical,  "presence" remains an issue, since at the time of creation of a social media-based narrative, not everyone with potential access will be logged on. For example, in Teju Cole's 2014 Twitter-based Hafiz -- where other Twitter users tweeted Cole's story as if they were themselves witness to a traumatic event -- there was a writer, Teju Cole; there were members of the audience who actively participated as actors; and there were other people, who, by the act of following Cole on Twitter, were a part of the participatory environment. If this were a real-time performance, photographs would be expected. Interviews of the audience might also be of interest, but, reproducing tweets does not convey the real-time experience of Hafiz, and, outside of the active participants, it might be difficult to identify who on Twitter was "there". Bushman created a chronological list of links for The Lizzie Bennet Diaries, but recreating the original audience experience was elusive. His company, The Horizon Factory, proposed (but did not find funding for) compiling social and interactive video, audio, text, graphics, and associated media and information into an app that would serve as a single package. Heidi Grundmann's Art Telecommunication does not provide a simple answer to the issue of documenting contemporary social-media based narrative in a different era of art practice. Nevertheless, in addition to its iconic representation of 1970's and early 1980's creative networked projects, it opens a door to innovative documentation and in the process suggests contemporary strategies. Given the central role of social media in contemporary lives, exploring the possibilities not only of creating but also of documenting social media-based works of cultural significance is an important issue. 1. Hank Bull, "WEINCOUVER" in Heidi Grundmann, ed., Art Telecommunication. Vancouver: Western Front; Vienna: BLIX, 1984. p. 123. 2. 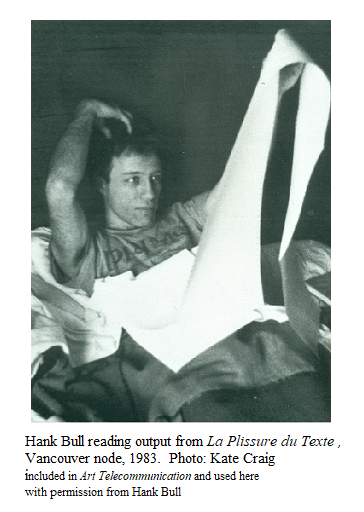 Eric Gidney's description of the conceptually proposed artists book delivery system conceived in circa 1981 by Steve s'Soreff, editor of the Avant Garde Art Review is in ibid, p. 12. 3. See the correspondence from Robert Adrian in the transcript of La Plissure du Texte in Telematic Connections: The Virtual Embrace, Walker Art Center, 2001. Curated by Steve Dietz. 5.Internet World Stats, "Internet World Users by Language - Top 10 Languages", June 2017. 6.Heidi Grundmann, "REALTIME- Radio Art, Telematic Art, and Telerobotics: Two Examples", in Annmarie Chandler and Norie Neumark. eds., At a Distance: Precursors to Art and Activism on the Internet. Cambridge, MA, MIT Press, 2006. pp.314-334,323-324. 7. Brian Andreas, "Hall of Whispers", in Judy Malloy, ed., Making Art Online, in Telematic Connections: The Virtual Embrace, Walker Art Center, 2001. Curated by Steve Dietz. 9. Robert Adrian's words are quoted on an unnumbered page that opens the body of Daniels, Dieter and Gunther Reisinger, eds., Net Pioneers 1.0: Contextualizing Early Net-Based Art, Berlin: Sternberg Press, 2010. 10. Roy Ascott, "Is their love in the telematic embrace?" in Ascott, Roy, Telematic Embrace : Visionary Theories of Art, Technology, and Consciousness, edited and with an essay by Edward A. Shanken. Berkeley, CA: University of California Press, 2007. pp. 232-246 , 237. This essay was first published in Art Journal in 1990. 11. Jay Bushman, "The Lizzie Bennet Diaries", in Judy Malloy, ed., Social Media Narrative: Issues in Contemporary Practice, hosted by The Rutgers Camden Digital Studies Center and Judy Malloy and the Rutgers Camden DSC Class in Social Media Narrative: Lineage and Contemporary Practice Facebook, November 16 - 21, 2016. 12. Dene Grigar and Stuart Moulthrop, Pathfinders: Documenting the Experience of Early Digital Literature, USC Scalar, 2015. Funded by a grant from the National Endowment for the Humanities. 13. Stuart Moulthrop and Dene Grigar, Traversals: The Use of Preservation for Early Electronic Writing. MIT Press, 2017. 14. Joseph Tabbi, "Foreword" in ibid, ix-xiv, xi. 15. Josephine Bosma, "Interview with Heidi Grundmann", Telepolis, August, 1997.